Pear Spirit Red Bartlett Pircher South Tyrol Line 70 cl. Buy now this product together with Waldhimbeergeist Pircher Raspberry Spirit South Tyrol L. 70 cl. Waldhimbeergeist Pircher Raspberry Spirit South Tyrol L. 70 cl. 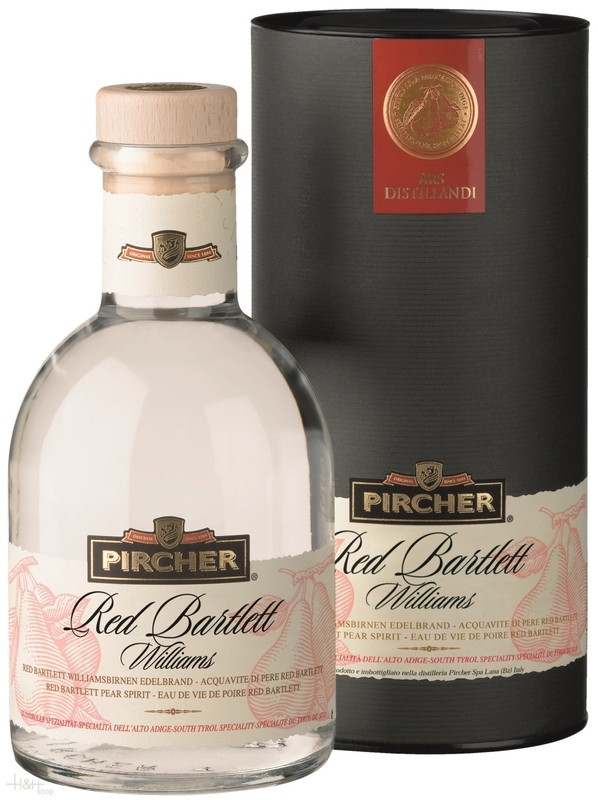 ready for shipment: in stock Waldhimbeergeist Pircher Raspberry Spirit South Tyrol L. 70 cl. The Sarner farm sausages are produced after an old farm prescription of well-chosen thin meat with special spices. They are slowly smoked in the smoke cellar at the Grammhof with coniferous wood, mountain pine and juniper stored up to the right cut firmness and the unique taste. House Speck Bacon Steiner 1/4 flitch approx. 1,25 kg. The classical bacon is produced of the best piece of the leg. Refined with spices, mountain herbs and salt, the bacon is pickled for 20 days. After a cold smoke phase with beechwood filings the bacon sides are matured for a total of 5 months in our pure mountain air at controlled temperature. Williams Pircher Pear Spirit South Tyrol Line 70 cl. 29,95 EUR / 42,79 €/lt. Obstler Apple Fruit Brand 1 lt. - L. Psenner South Tyrol 25,05 EUR / 25,05 €/lt. Framboise Fruit Brand - Geist 70 cl. - L. Psenner South Tyrol 21,75 EUR / 31,07 €/lt. Obstler 1 lt. - Roner South Tyrol 25,15 EUR / 25,15 €/lt. Plum Spirit 70 cl. - Pircher South Tyrol 21,90 EUR / 31,29 €/lt. Apricò Apricot Spirit Roner 70 cl. - South Tyrol 23,55 EUR / 33,64 €/lt. Apricot Spirit Pircher South Tyrol 70 cl. 25,35 EUR / 36,21 €/lt.